I'll be away this weekend, so I wanted to get the Featured Stitchers and the new themes up for August. Check out the blogs and websites of our featured stitchers - this month has a somewhat more diverse selection and features several blogs in non-English languages. (A large percentage of our contributors are English-speaking / writing, but not everyone!) Most, if not all, can be easily translated through Google's Language Tools, so don't let an unfamiliar language stop you. Google will translate an entire website for you, so if you haven't used it yet, it's worth a look. The themes for August are Bears, Fantasy, Geometrics, and Pets. I've tried to provide a large selection of freebies, but as always, if you know of other sites, be sure to let me know. I'm new...but have a finish! Hello and thanks for letting me join. 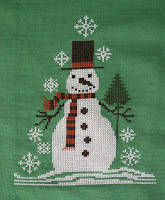 I love to do Christmas stitching and like to do it throughout the year so I don't feel overwhelmed come November...LOL. Here is my two latest finishes. Tis the Season and My Favorite Time both by Lizzie*Kate. 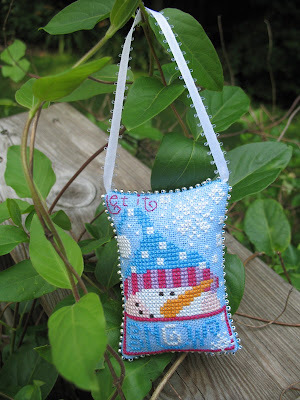 This is a Mill Hill Christmas ornament kit that I stitched this month. The mystery ornament was stitched for my July ornament, the other was sitting in my to be finished pile. It's been a while, but here is an ornament for July. Whew! been busy! 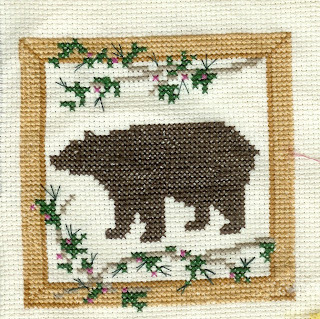 well I finished the Treasured Memories Bear ornament, went on to a snowman, then a Blue Ribbon Designs Health and Happiness ornament (freebie found here) for a friend. Hope you enjoy! I whipped this baby up in two days! I went through the list of Contributors in the sidebar, weeding out blogs that haven't been updated within the last few months. I found quite a few and removed the links as it's frustrating to click on a dead link or find a blog that hasn't been updated in ages. I did, however, discover one blog had moved to Wordpress when I stumbled across a link on another blog, so I put the blog back in. If you're reading this, and you've moved your blog, please let me know so I can update. I'm a big fan of having the links in the sidebar so we can get to know each other. I can't tell you how many wonderful blogs I've found just by following a trail from one blog to the next. So if you have a stitching related blog or online album that's not listed in our sidebar, please let me know and I'll add it. And if you are listed in the sidebar, please check the link to make sure it's your current blog. If you've changed platforms or blog sites, please let me know so I can update the link. Also, please remember to label your posts with the designer / source of your pattern to avoid copyright issues. Another designer, Jennifer Aikman-Smith, will be discontinuing the publication of her designs after her final two are released. Jennifer is pursuing other interests, but copyright infringement took its toll on her and weighed heavily into her decision. Therefore, it's very important to give credit where credit is due and respect the rights of the copyright owner. Labeling posts also helps out your fellow stitchers when they want to stitch the same piece or see more by the same designer. I don't know how often posters check back on their comments to see if there have been questions about their work, so it's nice to give that answer right up front to those that are interested. Do you know all week I've been feeling guilty about forgetting to post a reminder about the SAL Weekend (like I did for June), only to realize TODAY that it's this weekend? Perhaps I should look at a calender every so often! So it's THIS weekend for our SAL, and by our, I mean yours, because I have been severely lax in stitching ornaments for a few months. Between the moving, unpacking and getting settled, then vacation and yardwork, combined with me wanting to finish my housewarming gift to ourselves, ornaments have fallen a bit by the wayside. But never fear, there will be new themes and new featured stitchers up for August. And just as a reminder, if you do have a blog or online stitching album and you're not listed on the blog, let me know where to find you and we'll get you added to the list. 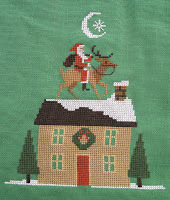 I think I will keep on stitching with you now in the same rythm, one small ornament each month, I just got out the graphics for the old world santas from TPS. Your posts are really motivating me! 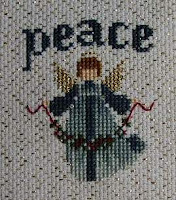 I have stitched 2 more of these angels with one more to go. They are for my granddaughters this Christmas. 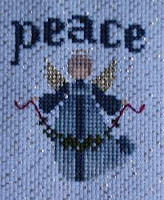 It's a freebie called Peace Angel by Told in the Garden and it is done on 18 count fabric with the gold flecks going through it. The angel is 2 1/4 inches long and about 2 inches wise. Have a great day stitching. I hope to catch up on my ornaments soon! 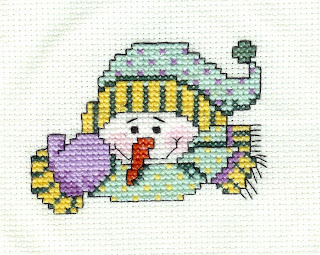 I received a new book in the mail, A Cross Stitch Christmas by Treasured Memories and couldn't wait to make this guy! I am also doing a bear and a deer in the same style! I started this little kitty at the beginning of the month and he stitched up pretty quickly. I have very little time for finishing with my work schedule so will have to wait until I have some vacation time (other than summer vacation) in which to do a mass finishing project. I'm going to try and sneak a few days off in the fall in which to get everything done before the holidays. Here is my July ornament and card. 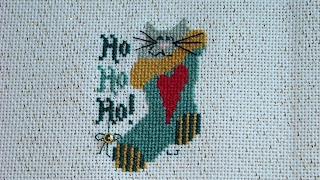 The ornie is from the 'Gift of Stitching' online magazine December 2007 issue. Designer is Debbie Draper. Stitched on 32 count Jobelan with Threadworx no. 1085. 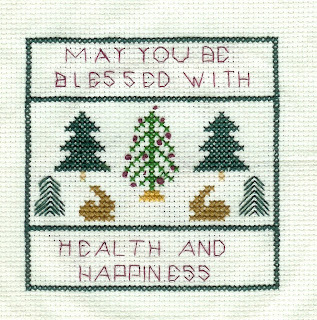 The card is a design from 'Two Hour Cross Stitch' by Patrice Boerens. Stitched on 25 count evenweave with DMC threads. I'm still a little behind but at least I have one done for June! I've made peace with being one of the world's slowest stitchers, but I really need to conquer my non-finishing tendencies. I've been on an Ornament Campaign, and I've finished a fair amount for me, but I haven't finished any of them. Sigh -- story of my life! 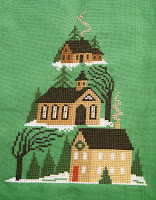 St. Ruth's Designs Christmas Cottage from JCS 1998 (I'm pretty certain it was 1998). Done in DMCs on opalascent lugana. LK "Faith" in DMCs on Wichelt's "Summer Sky" hand-dyed jobelan. I think this is a LK pattern, but I was going by a picture so I'm not sure. If you can lend any knowledge, I'd be grateful. Elizabeth Designs Christmas house form one of the JCSes - might have been last year's even. Charland's wonky tree from last year's JCS in Belle Soie over-dyed silk on natural linen. And, an "edited" and beaded LK from last year's JCS. From Gift of Stitching magazine. Following is a quick snap of some Christmas projects I have been working on - beaded baubles - fun way of using up the odd beads which seemed to be increasing in volume. My Christmas ornament for June is a Mill Hill Treasured Diamond Poinsettia from their 2008 release. 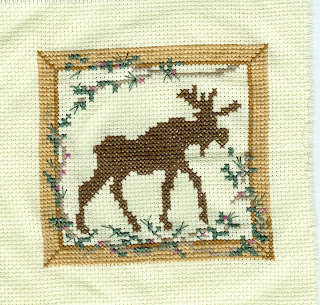 I love this range from Mill Hill and have stitched most of their designs which are just a pleasure to stitch. Sorry I don't have a better photo - this was taken in a hurry before I had to delivery the ornament to work for part of our Christmas in July display. Here is my SAL Ornament for June-July (I'm on vacances now and will come back only in August). This is the DMC Mini Kit Christmas tree. June ornament "Peace" - my first one! Yes, Pirjo has made her first contribution. I wanted to try something new (my friend loves blue!) and I used DMC 4220 for the hanging ornament (a bellpull?). The other one is more traditional and for a card. This is a freebie by Lizzie Kate. I finished my ornament yesterday, but could not get the picture until today. It's Time for Christmas in July! July is upon us, and that means the Featured Stitchers for July have been posted, as well as the new themes for the month. As always, if you have any links for ornament freebies, please sent them my way. 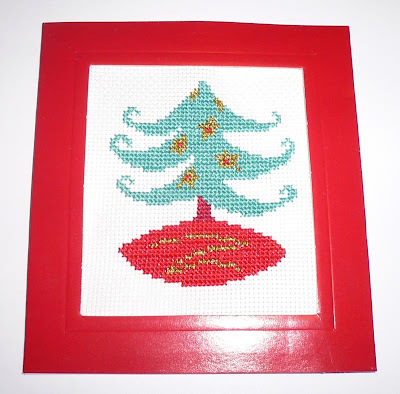 Links to finishing tutorials are also appreciated, as are charities to which stitchers can donate ornaments. I've been working on keeping our blog list updated - there's a few new blogs to check out. If you're not on the Contributor list and would like to be, please send me a link to your personal stitching blog or online stitching album. (Please make sure these blogs and albums contain primarily stitching content.) And each month, contributors are randomly selected from the list to be featured stitchers. By the end of the year, all blog/album owners will be featured. And on a final administrative note, please remember to label your posts and give credit where credit is due. Labeling helps keep the blog indexed properly so posts can be located quickly. Giving credit to the designer or publisher is extremely important for both free and paid charts. As has been mentioned many, many times, designers work hard to provide great charts to stitch, and it's only fair their creativity and effort is recognized. Please be sure to give proper credit in your posts, and for freebie charts, provide a link back to the designer whenever possible.